5 facts only few people know about hotel star ratings! From bath fixtures to elaborate lobbies – 5 facts only few people know about hotel star ratings! In the age of social media, all our decisions are based on ratings and user opinions, but the hotel industry is among the few businesses that have always used ratings and benchmarks to help patrons make their decisions. Now we’re all aware of the star ratings, and some of us even know a thing or two about how these ratings work, but we seldom see how much attention ratings pay to the minutest of details. Here are five things you probably never knew about star ratings and surely they will make you proud of the benchmarks the hospitality industry pursues! 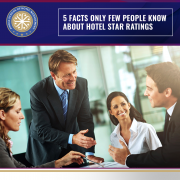 While star rating criteria differ across the world, a common checklist with over 800 points largely determines what star a hotel property manages to attain. This checklist consists of points to do with the property itself, the facilities, adherence to local laws, and most importantly customer service. https://jshm.co.in/wp-content/uploads/2018/12/5-facts-about-5-star-hotels.png 953 960 JSHM https://jshm.co.in/wp-content/uploads/2018/08/JINDAL-LOGO.svg JSHM2018-12-31 15:28:422018-12-31 15:33:345 facts only few people know about hotel star ratings! 5 trendy but unconventional Hospitality careers where students are acing it! 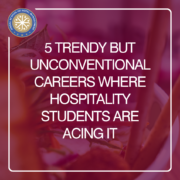 Until a few years ago, if you enrolled for a degree in hospitality your career choices would be limited to the kitchens, service establishments, or rooms division of a hotel or a resort! Not that it was a bad thing, but it meant running with the herd in an already crowded race. In a service industry driven by customers spoilt for choice, novelty is a necessary skill. And these trendy unconventional career options prove just how today’s young hospitality professionals are living the dream! With so many dining and accommodation options and a flood of opinions on social media, making the right choice is a confusing task. This is where bloggers save the day, and who better to advise than an industry insider! Many hospitality students are making a foray into blogging and brands are lining up to partner with them to ensure their brands get 5 stars in the minds of audiences that swear by the opinion of these bloggers.